Select the "Fundraising Event" button in your Admin Dashboard to access the even, followed by the "Manage" option. Then you'll want to find the "Fundraising Champions" tab at the top - it should be the third tab! 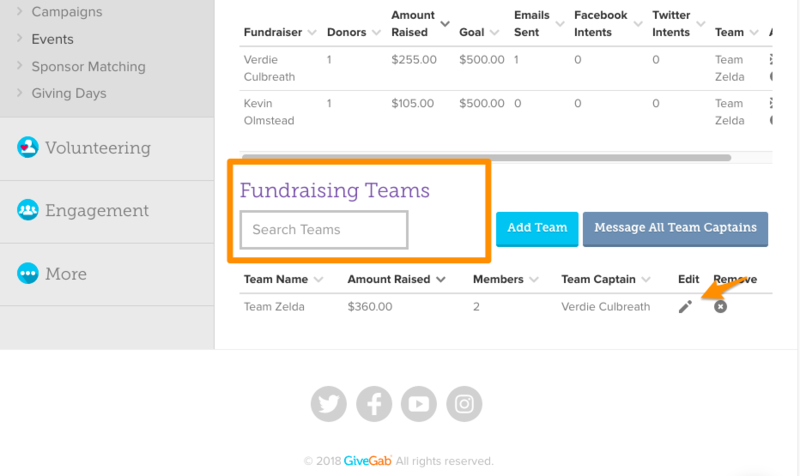 From the "Fundraising Champions" tab, scroll to the bottom of the page to the "Fundraising Teams" manager. From here, click on the pencil icon next to the Team Captain's name. After clicking on the pencil icon, you will be taken to a page that allows you to edit the page for your Fundraising Team. From here, scroll to the bottom of the page for a subheading labeled "Manage Team Captains." Here, you will be able to select which team members should have Team Captain privileges.